At you Mr. Heller: I blew up today on facebook but carefully pushed the post button because of your example. I am fed up and am going to fight back now. Both politically cuz I am on the right, and climately because we are right. After what I saw with Kavanaugh, I was an independent in 2016, but now I am voting against every single Democrat down the ballot. I just don’t care what they say. It is all lies anyway. I have not been so pissed in decades! It is amazing that ALL of my traditionally Democrat Jewish family and friends are now solidly Republican. I know that when most Jews get into the voting booth, they are like Pavlov’s dog, they just go down the list hitting the (D) button. But I believe there has now been a major shift. I tell my Jewish friends that voting for a Democrat is a slap in the face to if not a downright betrayal of Israel. They all agree with me! The outrageous and horrible Kavanaugh episode showed me that the Democrat party, along with their deep state and media operatives, will go to ANY measures to destroy someone if it suits their perverted political interests. And Brett Kavanaugh could have been you, me…anyone. From this day forward, the question you must always ask yourself is who will be next. Lindsay Graham was right…heaven help us if the Democrats ever regain political power in this country. I should be enough if you just feel you are a Native American. Like it is enough if you just feel you are a woman. No DNA required. No matter how bad your political opponents, likening them to nazi murderers drags YOU down to the level of those self same nazis. Perhaps you’d like to ask a holocaust survivor what they make of your comparison? Big government, big lies, big propaganda, repression of dissent, mob rule – Nazi party of 1933 and the Democrats in 2018. Leftists loved Hitler and Mussolini in 1933. Sorry that the truth hurts. Those who fail to learn the lessons of history are doomed to repeat it. As a Jew, I am quite concerned by the rise of fascism in the Democratic party. In light of the Holocaust and the long history of Jewish persecution, the anti-Israel screed coming from the Democrats is downright frightening. It has frequently appeared in the liberal media, including the Washington Post. Even Brother Bernie Sanders has thrown them under the bus! I guess I missed it; what does communist Warren say about Jews and Israel? Why does Massachusetts Senator Elizabeth Warren keep putting her foot in her mouth when it comes to the riots on Israel’s border with Gaza? I don’t know who is advising the Democratic senator on this subject, but it is remarkable how many misstatements are packed into those two sentences. The Gazans who have been killed were military-age men. Many of them are documented members of the Hamas terrorist organization. Even the ones who were not known to be official Hamas members were engaging in very Hamas-like behavior by throwing firebombs and rocks at the Israelis on the other side of the border fence, and by burning tires as a smokescreen in the attempt to breach the fence and infiltrate Israel. Some of the Gazans who were injured were likewise throwing firebombs and rocks. More recently, they flew kites attached to incendiary devices in order to burn nearby Israeli fields and forests. Some of them were injured from tear gas or gunfire because they chose to venture into a live-fire battle zone — a battle that Hamas has initiated, organized, and sponsored. Liawatha won’t be happy until Israel is the new Mecca. Only Griff & Co have the right to do so Climate Change Denier. Likening you to nazi murderers drags Griff & Co down to the level of those self same nazis. Just ask a Holocaust/Stalin/Mao survivor what he thinks of this video. Does Ms Griff not see her irony? The largest genocide in history is taking place right now, thanks to the alarmists and their bleating sheep. Why do they hate poor brown people so very much? Go watch the movie Gosnell and you will see exactly why Tony’s comparison is completely accurate. It is the Democrat party leadership who have dragged themselves to the level of nazis. 1) it is usually(and permanently) the other side using nazi terms. 2)this comparison is far more correct than her claims as she is genetically much closer to this guy than to any indian. You mean the way all the Democrats and Democrat media on TV did to George Bush and Donald Trump and republicans/conservatives in general – All the time ??? Please point us to your numerous posts expressing outrage at the Democrats and the MSM for calling President Trump a Nazi 24/7 – 365 for the past two years. We must have missed them. 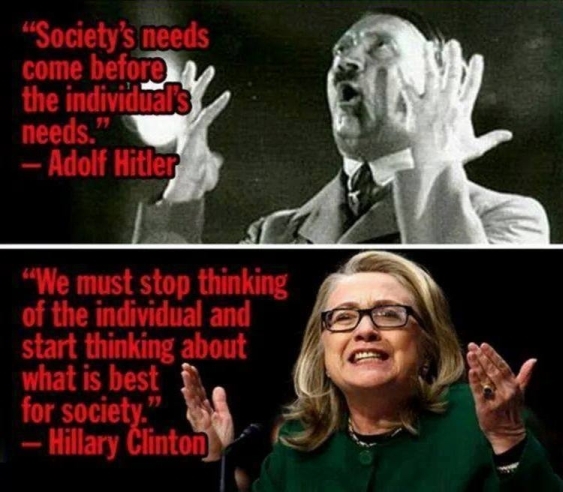 As a result of their non-stop despicable behavior, the Democrats and the MSM have earned this comparison. They openly urge anarchist & fascist Antifa to attack law abiding US citizens. They recently came out of the closet and confirmed that they really are socialists. So if they act like Nazis, why does it bother them or you to be called out? Tony is simply calling a spade, as spade. The cap fits. They should wear it! Griff overreacts to ideological comparisons and not perceived behavioral. Emotion blinds his critical comprehension again. Boy my comprehension needs a coffee! That should be “overreacts to perceived behavioral comparisons and not ideological. Pity there’s no edit function. Why the hell not. I mean look at what the DemonRats have been doing. If the Left wanna go down that road, and they always go down it first, then two can play that game Griff. Not so funny now is it? The Left has been mad in the proper sense of the word for too long. Running into a resolute “No!” for the first time has prompted an extraordinary fury. By this the disinterested viewer can understand that on every great experiment in authoritarian government in Europe, the governing classes eventually granted themselves the privilege of state murder. Today’s liberals and Democrats do not want to counter opposition argument, the want to eliminate it. Opposition is not allowed. It is not such a big step, historically, to eliminate the opponent. 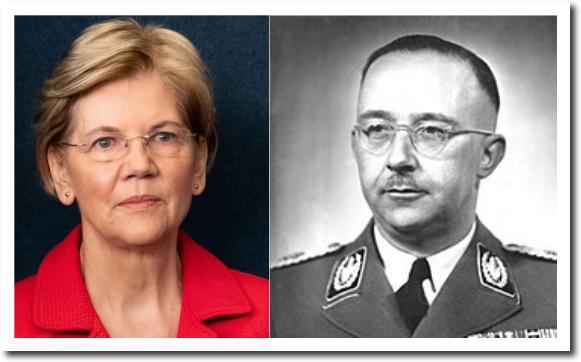 Placing Himmler’s image next to Warren’s is not out of place–given enough time on Democrat ambition. The Left is idiotic on labels. Any criticism, no matter how historically profound is immediately labeled as “Right Wing”. Even when it is from an apolitical perspective. Another issue is that when I’m calling for less government Leftists (some within my family) will call me a Nazi or even Hitler. That which is not compulsory, is prohibited. I use it to describe authoritarian government. “Progressives” and “Democrats” get enraged when we compare them to Nazis because they have always known that we are Nazis. The President, the Vice President, Justice Kavanaugh, you and me. Is it time to invoice Godwin’s Law yet? Oh, heck; charge for it! That is sooooo last century. The left has greatly enlarged, and completely relocated the Overton Window on this subject as well as many others. Bismark and the Kaiser(s) introduced socialist policies as well, so they must have been leftist Marxists! In fact, some of the early German tribes even made (gasp!) collective decisions! Maybe Germany was ALWAYS Marxist! The Night of the Long Knives gives a hint of Hitler’s attitude toward the socialists in his own party. Mein Kampf gives direct indications of how much Hitler hated Marxism. He fought Antifa in the street riots of the 20’s. 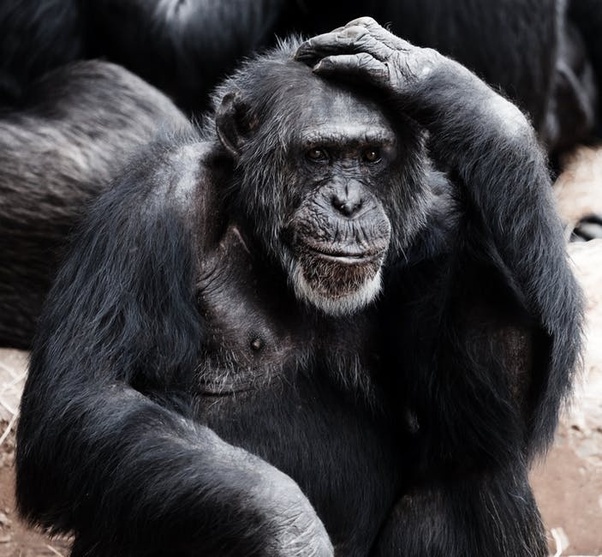 Classifying by ideology lets you stop thinking. Let’s stick with policy. Thanks for the climate updates, Tony. Let us not forget that Hitler villianized the Jews and today the left in much if Europe and in the US is doing the same or allowing it. Israel gas no friends among the government’s of the major powers in that EU. Damned phone. You know what I meant. Upon reflection, this has to be one of Ms Griff’s dumbest comments. So likening the Khmer Rouge to the Nazis would have brought their detractors down to the level of cooking humans in ovens and exterminating millions. Our progressive socialite has a highly sophisticated moral compass. She understands that Marxist mass murderers like Pol Pot, Mao, Stalin, Blokhin or Lenin cannot and must not be compared to Hitler or Himmler. Yes, mistakes were made, but it was in the name of progress. It’s just that things got a little out of hand. Only primitive uneducated reactionaries would liken these sincere and hard-working men to the Nazis.